Lafayette County, Missouri; c.1950 From Fiegenbaum-Gerber family; all rights reserved. This piece of property first became associated with the Fiegenbaum family when it was owned by Martin Herman and Clara Louise (Drewel) Fiegenbaum. Martin and his brothers, John Henry and Edwin Friederich, built the house in the early to middle 1920s with $400 worth of used lumber they purchased in Kansas City, Missouri. Source: Atlas of Lafayette County, Missouri (Rockford, Illinois: W. W. Hixson & Co., [1920-1928? ]), page 23. The Douthit Road farm is marked in blue. "M. & C. Fiegenbaum" identifies the owners as Martin and Clara. The city of Higginsville lies some miles to the northeast of the farm. 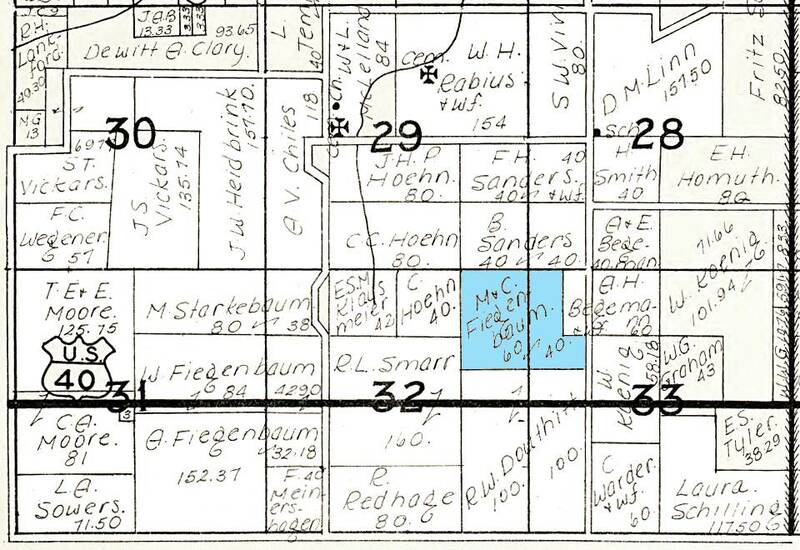 The town of Mayview, where the Fiegenbaums attended Zion Church, is a shorter distance to the northwest. The full map may be seen in the Map section of this web site. About 1935, Martin and Clara moved to the nearby town of Higginsville, where Martin ran the Missouri Farmers Association (MFA) oil franchise. John Henry and Katherine Margarete (Maun) Fiegenbaum and their children, who had been renting the Fred H. Sander property (2 farms north of the Douthit Road farm) since the autumn of 1930, moved into the house around the spring of 1936. Electricity was brought in around 1940. 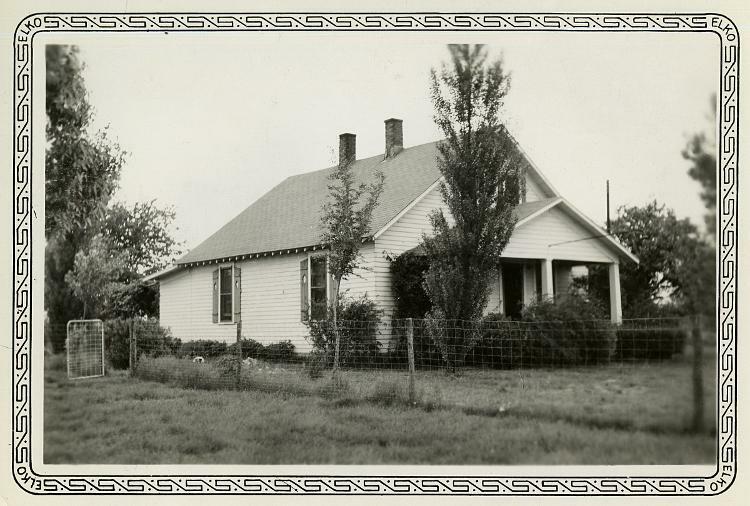 In the 1950s, the house became the home of Henry Martin (son of John and Katie Fiegenbaum) and Mary Ellen (Schmutz) Fiegenbaum and their family. Sometime later, Henry and Mary built a brand new house a short distance south (to the left in this photo) of this structure and the old home was torn down. 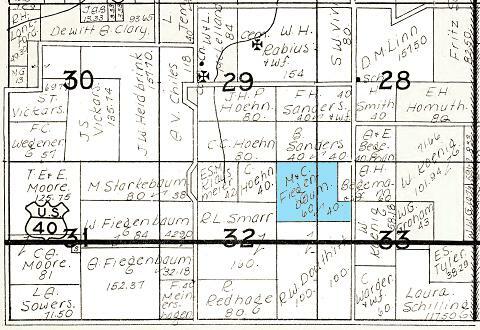 Shown here is a portion of a map of Lafayette County which shows the southwest corner (sections 28-33) of survey Township 49 North, Range 26 West. It is also the southeast corner of civil Washington Township. The heavy, "hairy," vertical line on the right margin marks the boundary with Davis Township to the east. U.S. Route 40 can be seen running east-west through sections 31 to 33 at the bottom of the map. The old national highway that used to carry traffic from Baltimore to San Francisco still exists, but in this region of Missouri its identity is disguised as a service road south of the newer Interstate 70 highway.